What is the state of faith in Mali one year on after the Islamist coup? It is one year now since a coup in Mali which plunged the country into an almost unimaginable crisis, and led to the north of the country being over-run by radical Islamist groups intent on enforcing strict sharia law. When these groups threatened to storm the capital Bamako, the French army intervened, sending troops to chase them out of the three main towns in the north. But the horror of the last year has had a deep impact on the spiritual and community life of Malians, who until the crisis described themselves as moderate Muslims with a tradition of tolerant and pluralistic Islam. In the first of two programmes from West Africa, Celeste Hicks reports on how Malians are struggling to understand what has happened to the north of their country, and how they’re also asking themselves deep questions about who they are and what will happen to the ‘Malian Islam’ that has shaped their country. As the capital prays in the vast Mosques, she finds out how traditional worship fits in with this particular strain of Islam and how the culture of this vibrant country which has produced internationally famous singing stars also came under threat from the Islamists looking to redefine what the faith means in Mali. 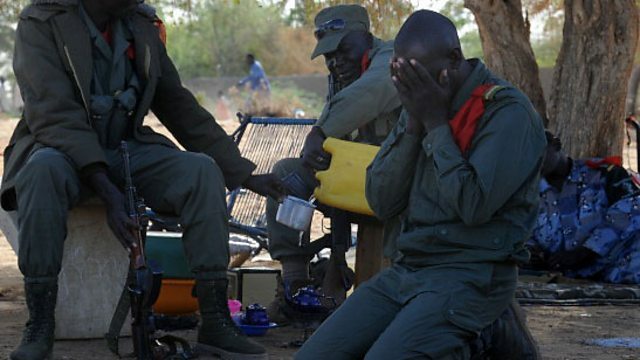 Image shows a Malian soldier praying in the northern city of Gao. Credit Pascal Guyot/AFP/Getty Images. The mosque built by Sheikh Haidara in the Banconi neighbourhood of Bamako, Mali.